The little bug is the size of a blueberry. Honestly, I don't know I'm looking at. One end of the line is a head, and the other is a rump or "tail". A coworker said they can see an eye, but they're full of it. 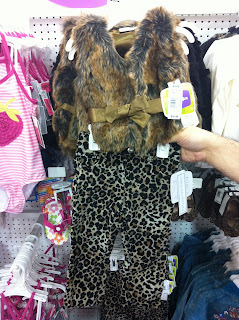 So this weekend, we went to Babies 'Я' Us for the first time (just for a look-sie). Neither of us has ever been to one before. I honesty thought that it was just a Toys 'Я' Us with baby toys (and diapers). I used to work at Toys 'Я' Us many years ago before Babies 'Я' Us existed. Going there is a eye-opening experience. The sheer amount of crap is astonishing! There's literally something for everything and then some. Several work friends told me they are over-priced and that I can get most of the same things much cheaper elsewhere. I'm thinking Amazon.com will be providing the bulk of SeaMonkey's supplies. It was nice to browse the clothing though. They had some cute boy and girl outfits and (forgive me for sounding extremely gay) this hot little number in the child-whore section. I kid you not, this outfit is for a two-year old. No, it was not in clearance Halloween, dress-up corner, or mommy & me. This is actually for sale with the regular clothing. Baxter will look SO good in that! She would be the most fabulous looking 2 year old at the next gay pride parade. OMG, what an outfit!! Crazy!!! I think I saw the matching daddy outfit at Faultline the other night. Oh... sorry, wrong kind of daddy. That's HILARIOUS!!! It's amazing what you can find in those stores. I guess the line is inspired by Toddlers & Tiaras, maybe??? Best wishes for a continued wonderful pregnancy! Beyond any doubt that outfit should be purchased and shared for picture taking purposes to every India miracle child. The photo collection will become a Huge Museum masterpieces.... a special treat. Am certain M.ike.and.Mi.ke are disappointed their beautiful girls are too grown to be the first stars portrayed in it. Religious freedoms and the "gay agenda are on a crash course in America and this is a speeding train no mere earthly can stop. 12 Weeks: No news is good news.